The landscape of online marketing is constantly evolving. It’s imperative that practitioners are constantly increasing their knowledge, ensuring they’re always utilizing the best practices and pushing boundaries to break new ground within the industry. Takeaway: We need to find better ways to make content easier to re-purpose so that it can be compiled and shared in a variety of formats (blog articles, brochures, slide presentations, etc. ), tailored to different personas and various applications (case studies, blog articles, white papers, etc.). While it’s not a new concept, our approaches have not evolved with technology, and most of us are recreating content each time, spending a lot of time re-formatting or translating content. Content should be stored in re-usable components in a non-formatted manner that is that is cataloged with tags to note persona, content type, etc. so that content could be easily filtered, sorted, and then pulled into content. Takeaway: B2B shouldn’t be boring, because it’s not just about the product, but the people behind those projects that matter. As marketers, we should have a profound and deep fascination of our customers projects. We also need to make the transfer of complex information as simple as possible. While it may be good to have the detail available, we need to get better at distilling things down into key, simple concepts. “It’s our job to ease people’s minds, not burden them with complexity”. Takeaway: 18.7% of online users have disabilities that Impair their usability. Here are some recommended tools to help with that: Site Improve, Chrome Vox, and Jaws. Takeaway: There’s a profound shift in communication exchange underway, and businesses haven’t caught up. The next generation is using messaging apps more than email. Currently, 80% of messaging marketing is mobile, and chatbots are at the top of the funnel for lead generation. We should start to implement messenger buttons instead of fill forms, and make sure we’re sending short messages with clear CTAs to make users engage. (Bonus: For free messaging tips and tools go to bit/ly/fb-blaster). Takeaway: Use “Heart” in your marketing plans: Empathy skills with searchers, open your heart to create personal brand connections, hug your haters (I.e. recover well on complaints), and surprise your audience. Make sure you go the extra mile when it’s not expected (Bonus: Use https://answerthepublic.com/ for conversation research). Topic: Making Lemonade: What Beyoncé Can Teach the Modern Marketer to Rule the World. Takeaway: We’re in the era of the “easiest wins”, so why do we re-market to people who are already our customers. Here’s what to do: Create ridiculous customer experiences, make it easy to connect, make sure people always have the same experience offline and online, surprise and delight with the little things, and create opportunities for our frontline people, allowing them to respond to real-time opportunities for empathy and to create tremendous experiences. “Leave no one behind”. For PPC – Put any current, potential, or former customer email lists and phone numbers into Google Ads and Facebook Ads so that you can create ads targeted at those groups; as Google Home Service Ads continue to roll out across the USA, likely being everywhere in 2 years, prepare by getting clients started on the background check process; use Facebook’s hyper-local geo-targeting options during events, excluding out-of-towners; ensure Google Analytics is set up so that you can see the conversation path of that a user took ( ex. Saw Google Ad, visited website 3 times, filled out contact form). Takeaway: Context has a tremendous implication. It can change everything. Because of this, we don’t always need to ask questions right away, but rather observe. Realize that people are aware they’re being watched while spending an average of 12 to 16 hours a day attached to media. Use ad recall when people are in good moods. How do you do that? ex. Movie theaters that run ads before the show. Use the “anchoring effect”. Set the bar in the potential client’s mind that competitors have to live up to. Takeaway: Find all social platforms potential clients are using and make sure employees are on them. It’s important to remember employees are being searched by the potential clients. Ensure they look the part and match the brand where applicable. Positive results can help when getting new leads, but the opposite can bring negative results. “You don’t want to just avoid bad branding, but you also want to have good content”. I know this only scratches the surface of what we brought back with us, and it will take a little time to digest all the useful information and how we can incorporate it into our online marketing services. 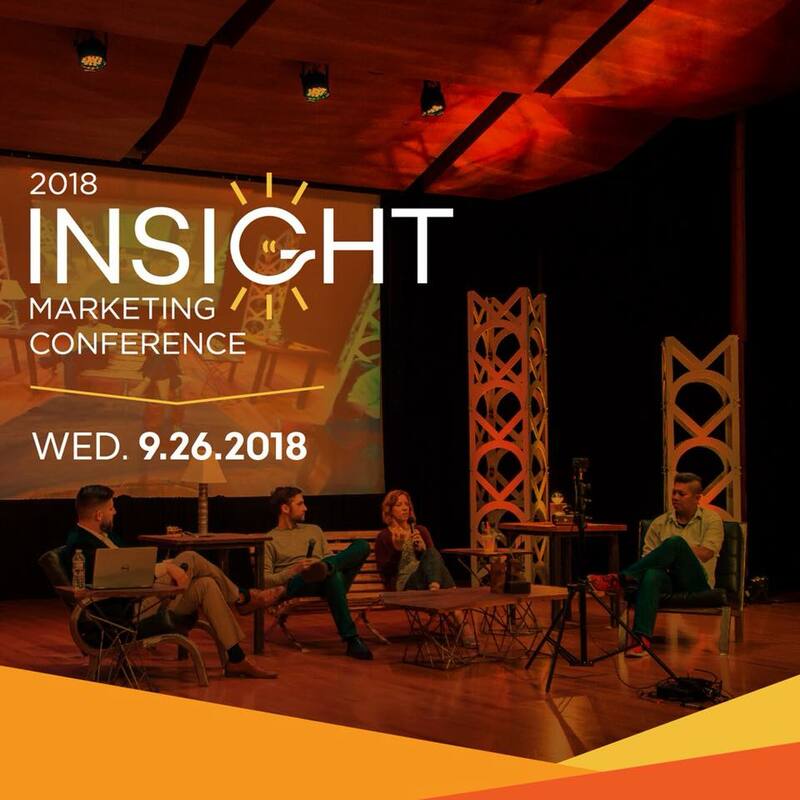 Did you attend the 2018 Insight Marketing Conference this year? Let us know. We’d love to get your feedback on what you took home with you and keep the conversation going.